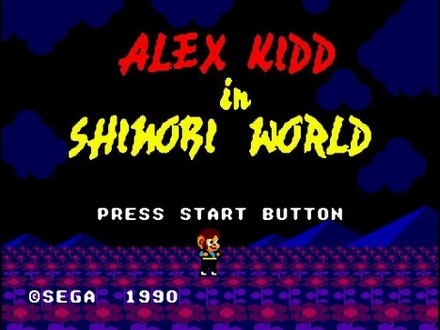 Alex Kidd in Shinobi World is the sixth game in the tremendously popular Alex Kidd series. Developed as a parody of Shinobi series, the game extends its happy hand to you, coddling players through its delightful and brief little world. 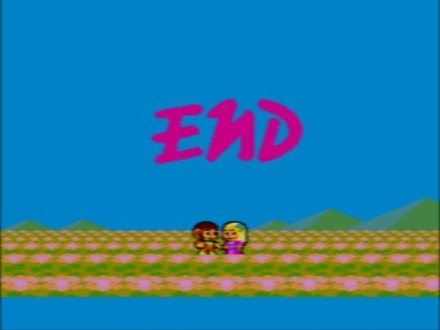 The game opens in a burst of color with Alex Kidd and his girlfriend exchanging tender mercies amid a radiant field of flowers. Suddenly the sky turns black with the evil Hanzo leaping down from the heavens and abducting your love, planning on using her to “seize ultimate power.” As you kneel down weeping, a good ninja spirit fuses with your body, giving you ninja moves and a sweet black and blue jumper, complemented with yellow sash. 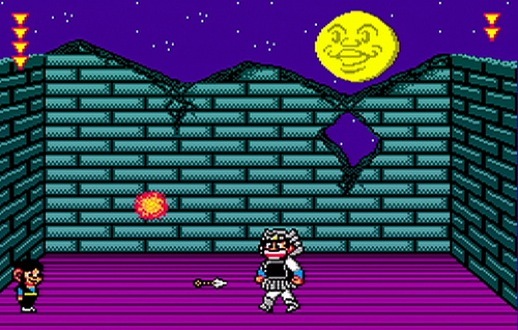 So begins Alex Kidd in Shinobi World and your quest through four rounds (yes, each area is called a round) to defeat Hanzo and rescues your beloved. The gameplay is a simplified version of Shinobi and plays surprisingly well. Alex Kidd has quite the array of moves. Sword slashing, naruto throwing, and fireball spinning are just the beginning of what Alex Kidd can do. The game makes players think of how to accomplish goals rather then flat out showing them as many other games would, an example being how to wall jump. On a long vertical screen, players can see two treasure boxes at the top of a long upstanding tunnel. With no platforms to jump upon and no bars to firespin from, the player must deduce how to wall jump on there own volition in a way that acts precursor to a comparable scene in Super Metroid. The games graphics are gorgeous. Sprite work doesn’t get much better than Alex Kidd and his many expressions. Alex has a face for every situation, my favorite being his “Oh Crap” face when falling off a ledge. The colorful vibrant worlds pair well with the games baddies. The variety of enemies is not what I’d call grand, but there usage is surprising. 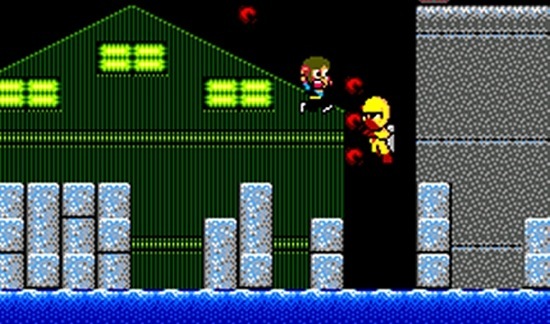 The very first level, two identical red ninjas charge you. Their difference; one is running while the other hops across the screen. These small differences show the care in the crafting of Alex Kidd in Shinobi World. Another example of the game’s charming touches comes in the second level of Round Four. If you jump in any of the pits (no, most pitfalls do not kill you nor does water drown you) you fall into an emerald green cavern whose guards are a cloaked skeleton who throws skulls and a Shaolin monk, both of which are never seen before or after this area making it all the more thrilling to discover this crypt. All of these features are enhanced by a sublime and joyful score composed by XOR, which are remixes from previous Shinobi games. It’s little details that make you love Alex Kidd, but that’s not to say this is game doesn’t have its downsides. This game has two main flaws: length and pace. The game is too short. When finished with the four rounds (each consisting of two levels and a boss fight) you are left feeling somewhat unfulfilled. This is amplified by the game’s relative ease. The pace of the game is a tad slow as well. No matter how much practice done or skill had, you simply cannot hurtle through levels because of Alex Kidd’s leisurely gait. While this may differ from other similar games, it is not a welcome change and it may make for a dull experience for more adept players. The boss battles are tame, offering little challenge but much entertainment. Ranging from ninja warriors to mini helicopters, the creativity behind the choices will astound you. The clash against Robster, a giant lobster who throws lemon wedges at you, is framed by a giant yellow and orange wall sculpture of a warthog monk standing before a mountain range. When defeated, Robster becomes a boiled entrée topped with what must be a garlicky butter sauce before exploding into spumes of smoke. As the game ends (spoilers) you are reunited with your cherished girl in the same field you began in. As the game declares the end with pink lettering, the game refreshes anew with Hanzo returning to steal your lady and you being imbibed with the good ninja spirit once more. A fitting ending/beginning as Alex Kidd in Shinobi World is a little piece of fun that you won’t mind cycling through a few extra times. Shinobi will firespin into your heart with a solid B. The Sega Addicts record episode 54 tonight!